As previously demonstrated, the hypothesis of “more guns = more deaths” not only is not true, but cannot be true historically in the United States. Despite that simple fact, “gun control” supporters still bitterly cling to the irrational notion that firearms are naught but the tools of murder and mayhem. So let us humor them for a second. 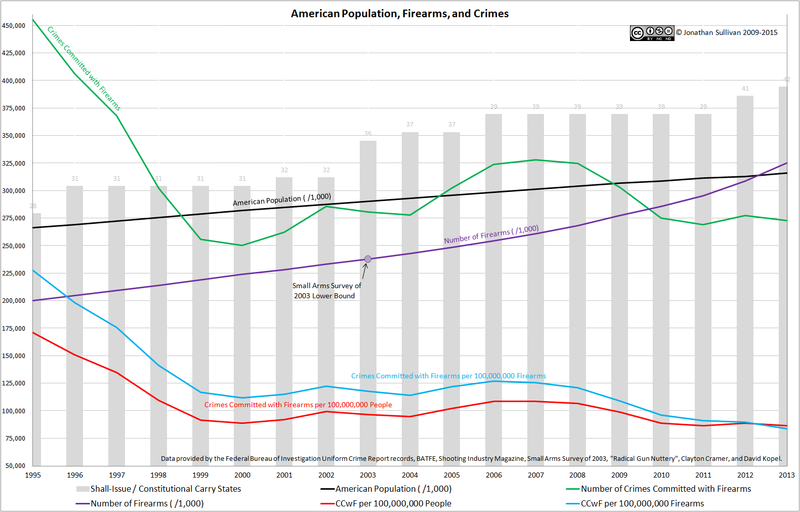 We know that the number of firearms in circulation in America has been steadily increasing for as long as the Bureau of Alcohol, Tobacco, Firearms, and Explosives has been tracking the relevant numbers. Likewise, the raw murder count in the States has dropped to numbers unseen since the 1960s. However, what about the percentage of those murders committed with the assistance of a firearm? 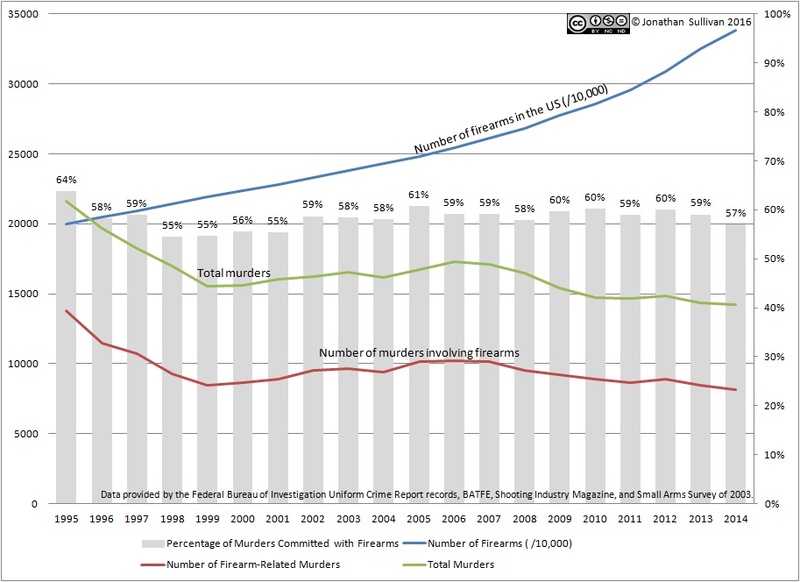 After all, if firearms’ only purpose is to murder other people, one would think that, even if the overall murder rate is going down, the percentage of murders that involved a firearm would be going up given the increased number of firearms in the country. 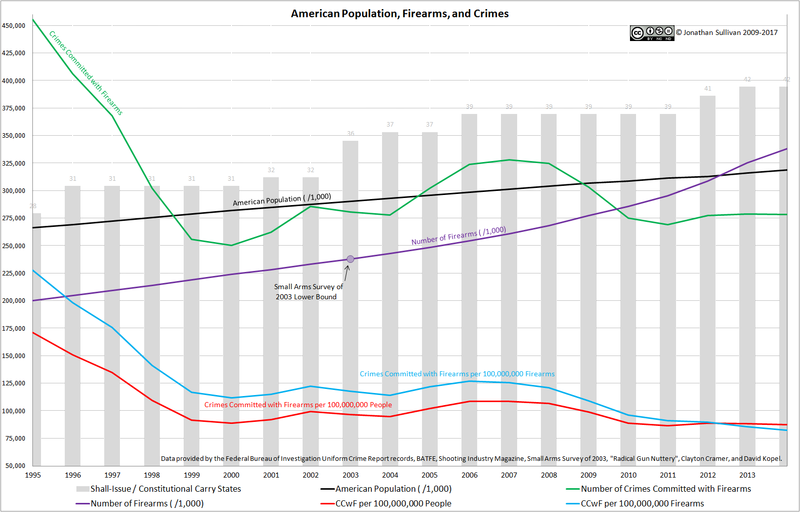 The grey bars track the percentage of murders that were committed with the assistance of a firearm, and, as you can see, those bars do not come anywhere close to echoing the consistent climb of the number of firearms in the United States. 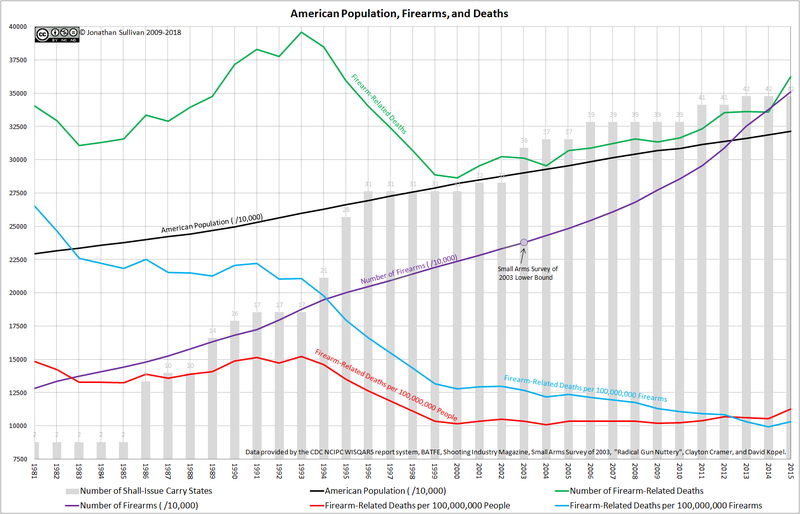 In fact, the trend line for the percentages is functionally level, with a slope of 0.0006, compared to the slope of 669.64 for the number of firearms in America. Oh, and yes, that does mean that, averaged over the past 20 years, at least 6,696,400 firearms have been produced in or imported into the United States every year. 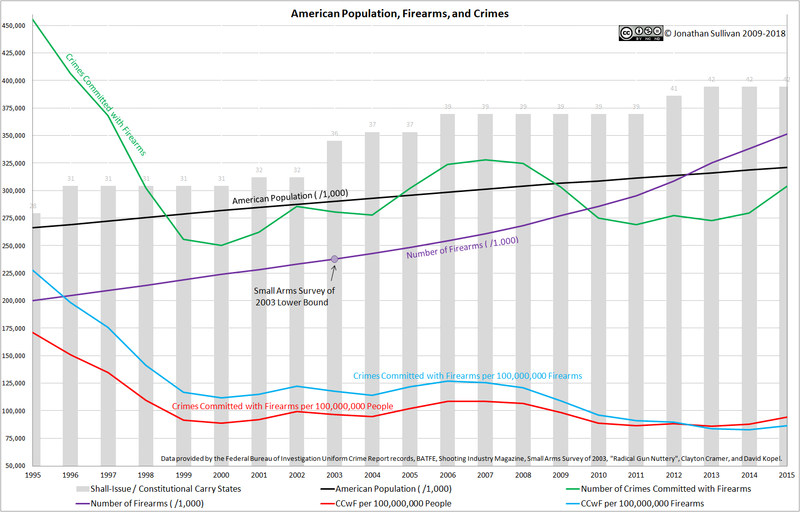 Despite the nearly level trend line of the percentages, there does exist a correlation of 0.14784 between the number of firearms in the United States and the percentage of murders committed with the assistance of firearms. This is, however, a tremendously weak correlation, and given the very narrow range of percentages – a maximum of 64% and a minimum of 55% – it is certainly not enough to draw any kind of causal relationship. So, could the increased number of firearms in public circulation lead to a higher percentage of murders involving those firearms? Based on the available data, yes, it is possible… but it has not been happening consistently yet. One of the favorite myths of “gun control” advocates is that as the number of firearms in Americans’ hands increases, so too does the number of firearm-related deaths increase. Superficially, this seems to make sense, and thus it is an appealing fiction to buy into. Fortunately, the actual data proves the hypothesis to be false. To begin with, I should clarify that we will be considering the rates of firearm ownership and rates of firearm-related fatalities, since raw numbers are affected by population growth or decline. Thankfully, the United States population is fairly well documented, and we will be using the Centers for Disease Control‘s information. Additionally, causes of death are also well documented, also by the CDC. Their WISQARS Fatal Injury Reports are updated on a yearly basis, and their data set spans from 1981 to 2012, so that will be our consideration window. 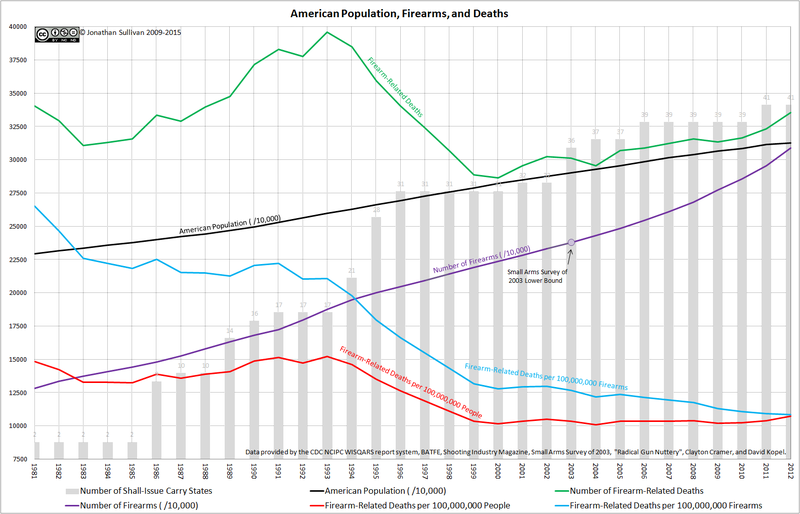 Unfortunately (from the analytical standpoint), the first part of the equation – the number of firearms in private Americans’ hands – is nowhere near as accurately recorded. Obviously I am quite sanguine with the federal government having no idea who owns what firearms or in what numbers, but it does make statistical examinations a little more challenging. However, the Small Arms Survey of 2003 is perhaps an authoritative estimate on private ownership of arms in various nations, and they calculate the lower bound of US firearm numbers in 2003 as approximately 238,000,000. The Small Arms Survey organization is decidedly against the “proliferation of small arms”, by their own words, so we have every reason to believe they inflate their numbers for greater impact, but we can accept that as a starting point. From that starting point, we will add, or subtract, the firearm production figures provided by the Bureau of Alcohol, Tobacco, Firearms and Explosives‘ Firearms Commerce in the United States document, at least as far back as 1986 (the earliest publication of that document). Before then, we will rely on the Shooting Industry News. Finally, while it does not factor into the “does ‘more firearms’ mean ‘more firearm-related deaths?” question, the number of “shall-issue” and “Constitutional carry” states is also included in the data, with the tallying done by Radical Gun Nuttery (their *.gif documenting the march of our rights across the nation is quite handy). 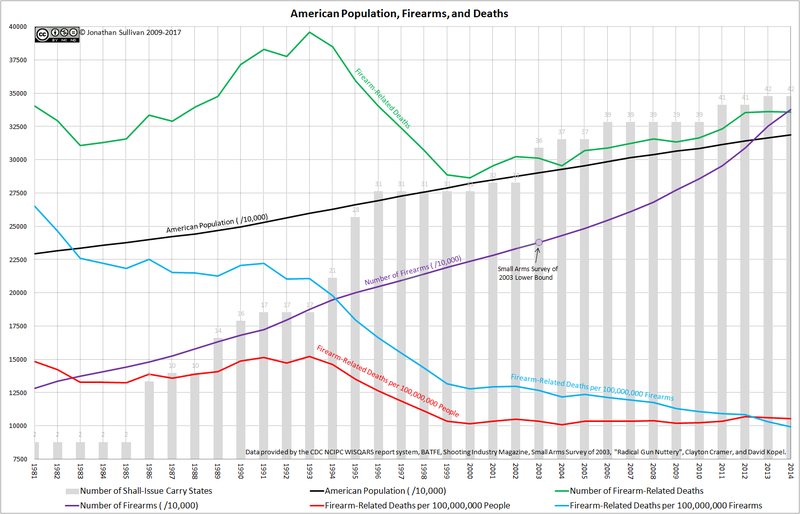 So, with all this data at our fingertips, does “more firearms = more firearm-related deaths” hold true? For those who want more than pretty pictures, when one considers the rates – i.e. the number of firearms or firearm-related fatalities per 10,000 people – the rate of firearm ownership correlates to the rate of firearm-related fatalities with a coefficient of -0.80155, indicating a strong, negative correlation between the two data sets. Even when you look at the raw numbers, the number of firearms in America correlated to the number of firearm-related fatalities – i.e. “gun deaths” – with a coefficient of –0.36471, which still indicates a negative correlation between those two data sets. At this point, it is important to clarify that correlation does not indicate, nor prove, causality… but I am not attempting to prove causality here. However, by stating that “more guns causes more ‘gun deaths'”, the anti-rights community is attempting to claim causality, and one that would outright require positive correlation. No such positive correlation exists. As such, the hypothesis of “more guns = more ‘gun deaths'” cannot be true. Feel free to spread this information as far as you like, and if you are so inclined, I welcome people checking my work (*.xlsx file). Unlike anti-firearms organizations, I make no attempt at hiding my raw data, or the ways it was crunched.